Between weekly meal prep and making at least two full meals every day, sometimes I feel like I never leave my kitchen. Don’t get me wrong: I love to cook, so I enjoy being in the kitchen. It’s the room itself I’m not too crazy about. My house was built in the 1950s so the kitchen is… well, let’s just say it could use an update. My husband and I recently bought a gorgeous new refrigerator (we skipped the protection plan), but unless a huge chunk of money falls out of the sky and into my lap, I’m stuck with the kitchen I have for the foreseeable future. So, like any good Penny Hoarder, I poked around the internet to find some easy, affordable kitchen upgrades I could do that don’t cost a king’s ransom. These five projects are my favorites. As a bonus, they’re easy to undo if you’re living in a rental home. The wall between the countertop and overhead cabinets is one of the most important visual elements in a kitchen. We spend a lot of time at the kitchen counter prepping and cooking food, so that area is directly in our line of vision. Since we see it so much, it might as well look nice, right? The trouble is, a simple coat of paint is boring, but backsplashes can be expensive. The answer is something you probably use every day. Danielle over at 2 Little Superheroes came up with the idea to use plastic plates to create a backsplash effect for only a few dollars. You could pick up a set or two of sturdy melamine plates online for about $15 to $25, but you already know there’s an even better option: Hit up a thrift store or yard sale and look for inexpensive plates wherever you find picnic items. When you’re ready to decorate your backsplash, craft a hanging point on each plate by popping the tab off a soda can and hot gluing it on the back of the plate. Tap tiny nails into the wall and hang the plates to create a DIY backsplash that’s as unique as you are. Renter restoration: When you take down the plates fill in the tiny holes left behind by the nails with toothpaste or a bar of soap. Aside from being dated, I like my kitchen just fine. The cabinets and cupboards, however, are another story. They’re cheesy, brown faux wood-grain monstrosities that date back to when the house was built. I haaaaaate them. 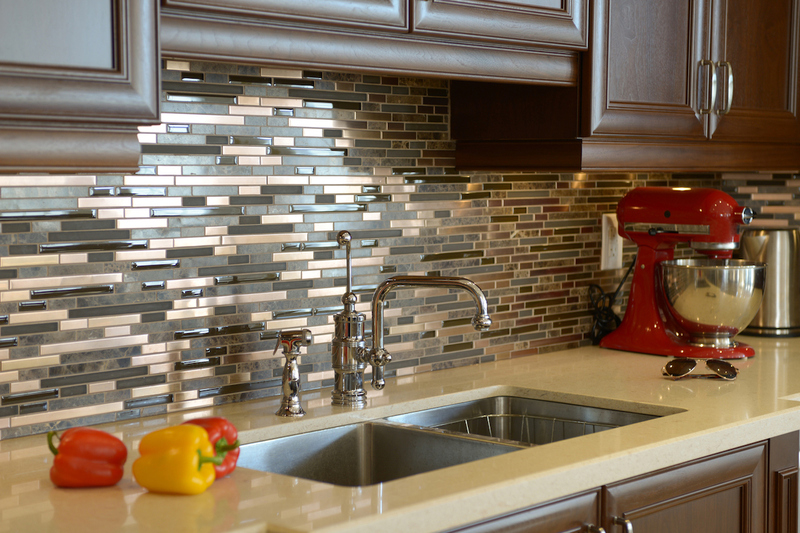 If your cabinets are as unsightly as mine, consider covering them in contact paper. Self-adhesive contact paper comes in pretty much every style and pattern you can think of — even chalkboard. If that seems like too much work, go radical. Take the cabinet doors off completely and use these four open shelving tips to keep everything tidy and company-ready. Renter restoration: To be sure the contact paper won’t leave any residual damage when you remove it, test it on an inconspicuous area first. As you’re removing kitchen cabinet doors, number them (and the corresponding cupboard) using a small piece of masking tape so you know where to rehang each one. Removing and replacing them with updated modern hardware made a world of difference. Renter restoration: Gather all the old hardware and screws in a plastic bag and store the bag in a kitchen drawer so they’re handy when it’s time to replace them. Clear and declutter your countertops for an immediate cosmetic lift. Stash the small appliances you rarely use in cabinets and corral cooking utensils in that pretty vase you picked up at a garage sale. If you’re willing to ruthlessly get rid of kitchen stuff you don’t need rather than just rearrange it, sell it on LetGo to make a few bucks. Renter restoration: Label small appliances and kitchenware that came with your rental to easily sort them from your own possessions when it’s time to pack. New textiles are an inexpensive and endlessly customizable way to freshen your up kitchen. Pretty dishtowels will only set you back a few dollars, especially if you pick them up at a secondhand store. Rugs tie a room together and make even the most uninviting spaces seem cozy. Unfortunately, they can be pricy, so don’t splurge on a new one until you’ve read how easy it is to make a rug of your own using easy-to-wash material. Don’t overlook what the right window treatment can do to spruce up a space. I’m not talking about tacking up some color-coordinated dishtowels across the kitchen window, either. Depending on the size of your window, a nice set of curtains can run you as little as 10 bucks — less if you can find some you like at the thrift store. Renter restoration: The great thing about upgrading your kitchen with rugs and towels is that you can just take them with you when you move out. Lisa McGreevy is a staff writer at The Penny Hoarder. She so excited about her new refrigerator she practically hugs it every time she gets home.